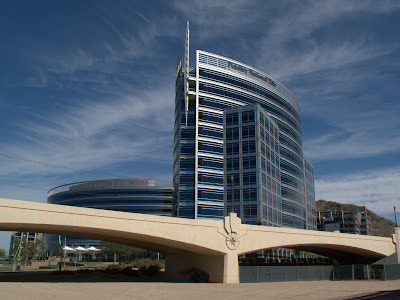 The new Hayden Ferry Lakeside development adjacent to the Mill Avenue Bridge in Tempe Arizona. Located on Tempe Town Lake, a dammed up portion of the Salt River, the site is adjacent to the Hayden Flour Mill and Silos. The mill was owned by Charles Hayden, the founder of Tempe. The Haydens also operated a ferry across the Salt River at this site. Canon G10, 1.400 sec at f/8.0, ISO 100, 15mm effective focal length.